There are bands you follow from the beginning and bands you arrive late to the party yet when they celebrate an anniversary it’s usually a win for all their fans. I wasn’t late to the party with Lacuna Coil but I wasn’t their from the start either. I first found them when Comalies was released late one night when I couldn’t sleep due to a bad tooth and saw the video for “Heaven’s A Lie”. I remember being blown away by the song, as well as Cristina Scabbia’s stunning beauty and powerful voice, and made sure to purchase the album quickly. Needless to say I’ve been a fan ever since yet when they announced that they’d be recording The 119 Show – Live In London at the O2 Forum Kentish Town to celebrate their 20th Anniversary as a band I was shocked it’d been that long and curious to see what they’d do. Thankfully they did what many bands say they’re going to do but actually never end up doing, play from all over their catalog. All too often we get the promise of “songs throughout our catalog” from bands for anniversary shows only to get the most recent albums tossed at us for sales purposes. Lacuna Coil stuck to their word by opening with three songs from early in their years, that we new to me as they’re before Comalies, with “A Current Obsession”, “1.19”, and “My Wings”. I totally dig this move in a set list for an anniversary show, especially one recorded for the masses, because it turns on fans to songs they’re not familiar and can let you hear the growth of the band throughout the show. As it continued I found myself struggling between my television production side and my fan side because there were many angles and shots that were washed out by the lighting. The director in me was questioning if the director had attended a rehearsal but then I reminded myself that as a fan I’m often blinded by the stage lighting at times so why shouldn’t the camera have that. It helped to make it feel more like a live show and less like a music video. Especially since the audience was almost muted and rarely seen. I’ve seen Lacuna Coil live and “Swamped” is always one you can hear the audience go nuts over and sing along with as if they were the performer. Not the case here, they’re barely there as background. Even during “Blood, Tears, Dust”, a newer but highly favorited song by Lacuna Coil fans, you get the audience roar at the start and then they’re almost muted. Sure you want the band to be THE star, it’s their show, but the audience should be somewhat audible beyond the beginning and end of songs. It’s a tough balance that rarely gets perfected in recorded live shows. What did blend perfectly into what Lacuna Coil brings to an audience was the addition of the Incandescence Circus Theater Company. They’re acrobatics and choreography created the perfect addition to the anniversary party. Even Cristina Scabbia got into the act during one of my favorite moments in this show. After an “Intermezzo” performance by the Incandescence Circus the curtain revealed Cristina solo on stage with a pianist and connected to a high wire to raise her up as she performed “Falling” and “Wide Awake”. I’ve often said that Cristina Scabbia is one of the best singers in metal today and this proves it. These two songs live were just her and the audience, a truly mesmerizing moment recorded for all the world and future generations to see. 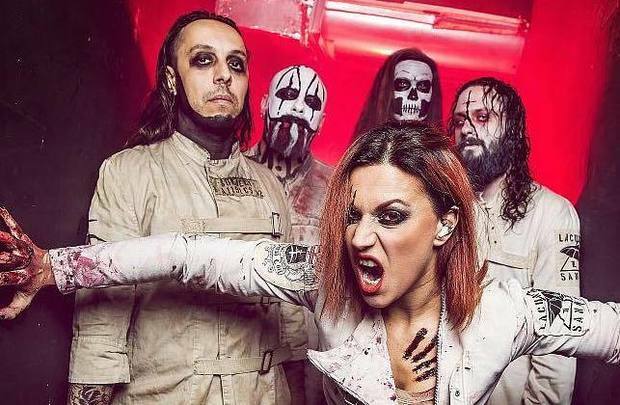 Closing with “Nothing Stands In Our Way” was the right choice for this filming because not only has it become an anthem to many it’s the mentality everyone needs to do anything for an extended time, be it a band like Lacuna Coil or anyone. And while this is a BluRay I still found myself hoping they would continue playing, like at an actual live show that you just don’t want to end. The full energy of the band is captured in The 119 Show – Live In London making it the perfect gift to their fans for a 20th anniversary.